Musical theatre isn’t usually the first place you look for a modern horror story, but in this new short creation by Bella Barlow and A.C. Smith, the eclectic mix works incredibly well. While it could do with tightening up in some areas, particularly near the end, the plot moves along with intrigue and excitement, with the tuneful score slotting in seamlessly. Lock and Key takes place over one night where newly appointed publicist assistant, Jess (Evelyn Hoskins), is putting in another late shift for boss from hell – think Devil Wears Prada – Samantha (Tiffany Graves). 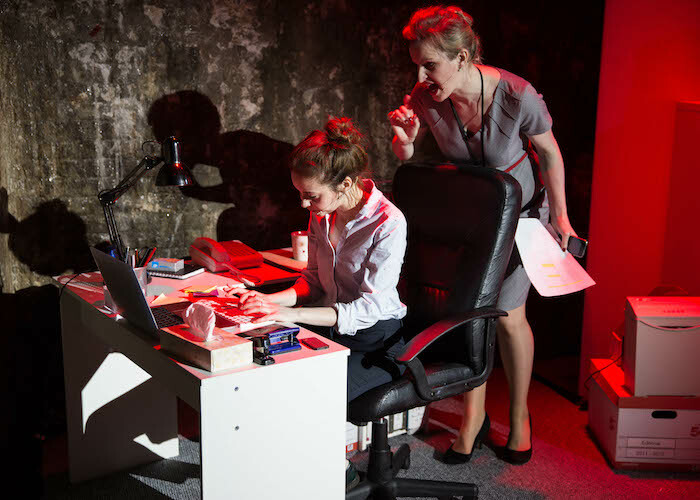 The show begins by exploring the idea of workplace bullying, but when Jess is left alone with the keys to Samantha’s secret cabinet (yes, you can see where this is going), things turn much more sinister and surreal. Smith isn’t afraid to add humour to the dark undertones of her book and lyrics, and this is particularly true during “Little Red Key” that pokes fun and satirises its spooky narrative. This bridge into the horror section of the show is immediately followed by a scene featuring a talking fictional bear (presumably in Jess’s mind), and it is then that the show really takes a turn for the weird. The great thing is how well this pivot actually works. In fact, it is a shame that the musical seems to pull back too quickly from this unusual side step, and almost rush to the final section. There are genuine thrilling moments during the setup and slowing things down a little, allowing for pauses and silence at times, may have helped to build the suspense and increase the shock of the reveals. Evelyn Hoskins does an excellent job as Jess, meticulously demonstrating her characters’ thought process through both her expressions and actions. The emotional journey of her character could have been explored further, however, as the character seems to flip/flop multiple times when making decisions. This is possibly more a problem with the writing than the production as there isn’t enough scope to allow her character to really develop. Hoskins is given multiple occasions to show off her magnificent voice and does so most notably in the beautiful ballad “Chilled Water”, and the upbeat “Something Right” (which also includes a hilariously wonderful piece of choreography using a hole punch). Tiffany Graves successfully makes Samantha excruciatingly irritating and dislikeable. The utter hatred she allows you to feel for her makes the juxtaposition during the heartrending “Press the One” even more striking as she humanises this seemingly irredeemable character. As part of the Vaults Festival, the performance space is situated in a tunnel under Waterloo Station. This dingy setting only adds to the appropriateness of Alice Simonato’s detailed closet-esque office. There is no arguing with Jess when she complains about the damp in her office – you can see it dripping down the stone walls. There are certainly improvements that could be made to this unique new musical, but overall it is a gripping short story with some stand out songs. The show rightly puts its faith in seasoned actors Graves and Hoskins who both give stellar performances in a well-produced and designed production.